To stare or not to stare? The Malibu Sport has taken curb appeal to the next level. For a model that continues to defy expectations, the all-new Malibu Sport is a bold statement of intent. The new Malibu Sport is a bold statement of intent that was born to defy expectations. From aggressive styling, blacked-out features and a turbocharged 2.0L 250 HP engine, this Sport surprises from the outside-in. Aggressive accents like blacked-out badges and a black chrome grille enhance an already distinctive look. Sporty black ground effects, including front lip and side skirting, complete the performance styling. What’s the point of going fast if you don’t look the part? Roll on, brother. These 19” black alloy rims give the Malibu Sport extra stability and an attitude that does all the talking for you. Some cars merely look fast. This isn’t one of them. The new sport kit gives the Malibu Sport a strong presence on the road that's backed up under the hood. 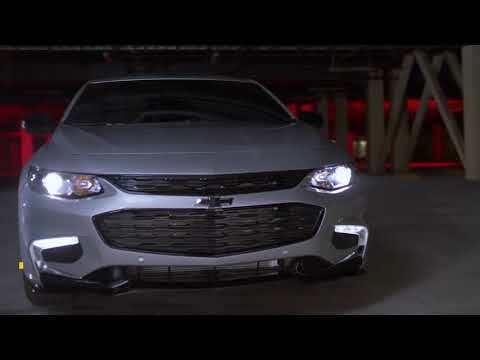 With a 250 horsepower, 2.0L turbocharged engine, the Malibu Sport is as fast as it looks.